Stunt Kites In 2008, At The Adelaide International Kite Festival. If you are an expert stunt flier, this page on stunt kites in 2008 might not be of much interest since you 'know it all' already. However, if you are new to the world of stunt kites, read on for a few small snippets of information, plus a few photos. The images are from the Adelaide International Kite Festival in 2008, of course! 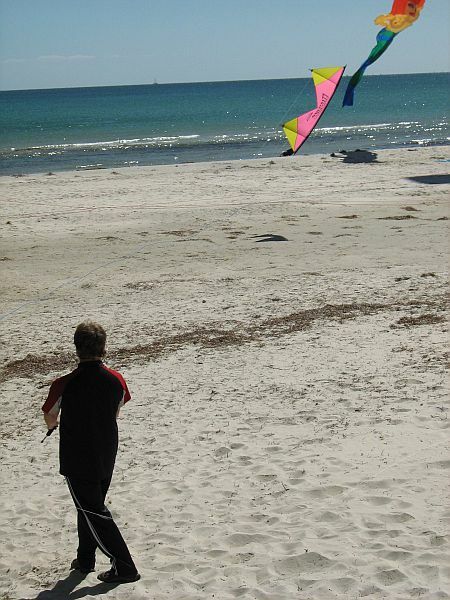 We didn't see a large number of stunt kites in 2008 at the festival. The different types where well represented though. Unfortunately, on sifting through our photos, I could only find images of 2 types .... oops! Next year, we might be better organized and specifically target different types of kites with our camera. Everybody seemed to be just flying for fun. In any case, we didn't notice any super-precise aerial figures being flown! Personally, I've only ever flown a cheap $10 stunt kite plus the decidedly better quality Peter Powell MkIII. However, I've done plenty of research to publish the Stunt Kites pages elsewhere on this website. There were a number of these Delta kites, mainly being flown over the dunes some distance from the waterline. For example, the large black and white Delta in the photo above. The long tail traced out its movement in the sky. The single-liners were mainly anchored in the flat sandy areas or to the jetty. Speaking of the jetty, we noticed a man flying his Delta stunter very close to onlookers walking up and down the jetty. He knew what he was doing and was hovering the kite, so no-one was in danger of getting hit hard. People were suitably impressed. However, we noticed his flying lines were passing rather close to another kite line... Sure enough, a minute or so later, the kite snagged and flopped into a pool of sea-water! Note to beginners: don't fly your stunt kite near people! Someone might end up with a nasty whack in the head. These kites move quickly and have sharp corners. No more photos unfortunately, but we did see a large white parafoil being flown as a stunt kite. These can be a bit of a handful when the breeze gets up a bit, due to the large amount of pull they exert on the lines! 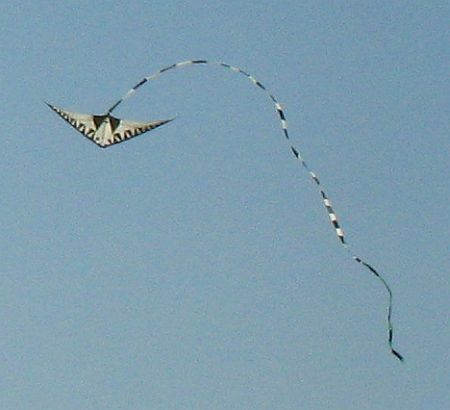 Like Delta stunters, power kites like this parafoil are usually on 2 lines for stunt flying. Finally, we saw the stack of 3 small black deltas that made an appearance last year as well. It's quite possible it was the same expert stunt flier in action too. This year, the winds were lighter so the little deltas weren't slipping through the air at the incredible speeds we saw earlier. Still, they were smooth, carving many straight lines as well as curves in the air. That's about it on the stunt kites in 2008 that we saw at the festival.